China Open, PV Sindhu, Kidambi Srikanth Highlights: PV Sindhu went down to He Bingjiao while Kidambi Srikanth lost to Tien Chen Chou in the quarterfinals. China Open Highlights: PV Sindhu, Kidambi Srikanth crash out of the quarterfinals. China Open, PV Sindhu, Kidambi Srikanth Highlights: PV Sindhu’s campaign at the China Open 2018 came to an end as she suffered a 17-21, 21-17, 15-21 defeat at the hands of China’s He Bingjiao in the quarterfinal. It is Sindhu’s third straight loss at the hands of Bingjiao this year. Kidambi Srikanth, who entered the quarterfinals on the back of a three-game victory over Indonesia’s Tommy Sugiarto, followed Sindhu out of the tournament as he went down 21-14, 21-14 to Chinese Taipei’s Chou Tien Chen in the quarterfinal round on Friday. Here are the highlights of China Open quarterfinals. This is the end of India's singles campaign at the China Open Super 750 as both PV Sindhu and Kidambi Srikanth crash out in the quarterfinals. Srikanth goes down 21-14, 21-14 to Chou Tien Chen in just 35 minutes. At the end of the day, Satwiksairaj Rankireddy and Chirag Reddy will play the mixed doubles quarterfinals against Wahyu Nayaka ARYA PANGKARYANIRA and Ade Yusuf SANTOSO. Chou Tien Chen responds well after the mid-game break, racing towards victory by taking a six-point lead. Not the day for Indian badminton! Kidambi Srikanth goes into the mid-game break with a gap of three points after trailing Chou Tien Chen 4-10 in the second game. Back-end errors by the Indian and some brilliant defensive strokes by Chou in the second game. Srikanth bridges the gap between him and his opponent by reducing it to two points. Not a very strong start by the Srikanth though. He really needs to turn this game around if he wants to go ahead. Chou Tien Chen comes from 8-10 down to win the first game against Kidambi Srikanth 21-14 in 16 minutes. Srikanth falls back after the break to let the game slip away from his hands. He now needs to win the second game in hope of dragging the match into the third game for any hope of advancing to the next level. Game point! The Taiwan shuttler has built a strong six-point lead and is a point away from winning the game. Some smart shots by Chou Tien gives him the edge after the mid-break. Srikanth tries to make a comeback but is it too little too late now? Chou Tien Chen running away with the lead. He wins three points immediately after the first-game break to make it 14-11. Srikanth needs to make a comeback before it is too late. Srikanth goes into the mid-game interval trailing Chou Tien Chen by a point. It is a tight start to the first game. Both players doing well to keep the match level. The match is now level at 10-10. The Taiwan player is not going to let Kidambi have it easily. He responds with every point with a hard fought game to keep the match from slipping from his hands. The Indian shuttler does well to take a two point lead at 6-4. A sharp shot by Kidambi and the Taiwan player is unable to make it. Kidambi now likely to go for strengthening his lead. Kidambi Srikanth vs Chou Tien Chen in China Open quarterfinals action. Match underway! What a beginning. Both players not letting the other take the lead by more than a point at the start of the first game. Game level at 2-2. 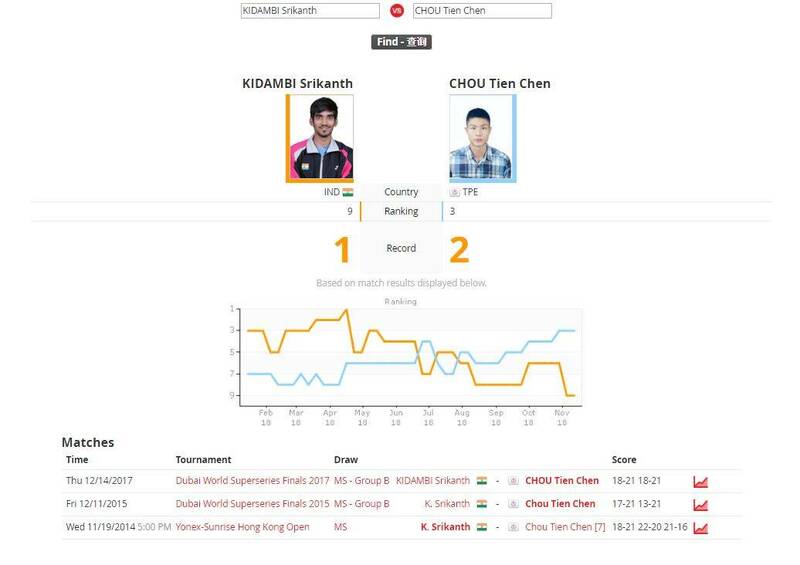 This is the fifth consecutive tournament for Kidambi Srikanth where he has reached the quarterfinals. Sindhu is out. Srikanth to carry India's campaign. He Bingjiao beats PV Sindhu! PV Sindhu crashes out of China Open after losing quarterfinal clash against China's He Bingjiao 17-21, 21-17, 15-21. Three points on the trot for He Bingjiao, the last of which came from an unforced error from Sindhu as she suffers a loss of concentration. He Bingjiao moves closer towards win here. PV Sindhu has fought hard to bring herself closer to He Bingjiao and the pressure is now mounting on the Chinese shuttler. He Bingjaio was leading by 7 points at one stage, and now is she is leading by just 1. PV Sindhu is trying to bring on something here as she scores five points on the trot to cover the gap. He Bingjiao has not helped herself with wider-than-mark shots. CHEERS FOR HE BINGJIAO! Three smashes and three points for He Bingjiao. PV Sindhu is now trailing by 7 points and it seems all but over for the Indian shuttler here. DROP SHOT! PV Sindhu makes a terrific drop shot after a beautiful rally and earns a much-needed point. There was no chance for He Bingjiao to get a reply to that, even though she was standing near to the net. SLOW SMASH! A hard smash by He Bingjiao but PV Sindhu answers, so the Chinese shuttler follows it up with a slow smash. Sindhu had no clue where the shuttle was travelling. Good straight non-stop resilient attacks from He Bingjiao continues to trouble PV Sindhu. The Chinese shuttler though hits one in the net and drops the rally, and a point. A good rally before He Bingjiao pushes one longer than back line and gives away an easy point to Pusarla V Sindhu. PV Sindhu vs He Bingjiao China Open Quarterfinal Game 3 begins - Can PV Sindhu reach semifinal? DRAMATIC FALL! He Bingjiao tries to defend a quick body shot from Sindhu and she falls dramatically down on the ground. Never mind, though, she is back up. This game is far from over and the pressure building on PV Sindhu once again as she wastes a serve with a smash on the net. Gives an easy point. Still in lead, though. A beautiful drop shot from PV Sindhu forces He Bingjiao to fly the shuttle upwards miles high into the air. Sindhu takes the time to chop it down with a smash. SMASH! He Bingjiao's skills of creating angles really coming into play here as she leaves PV Sindhu completely confused regarding her movements. Awkward angles to play for Sindhu, and she messes it up. REVIEW SUCCESSFUL! A relief point for PV Sindhu as she just defends awkwardly a fast and quick smash from He Bingjiao. Initially called OUTSIDE, Sindhu calls for a review. Replays showed it was IN by an inch. PV Sindhu takes a lead of 11-7 at the break in the second game against He Bingjiao in China Open quarterfinal match. A few unforced errors from He Bingjiao has earned PV Sindhu a lead. The Chinese shuttler is trying to slice Sindhu's quick strikes, but her attacking prowess keeping her far from accuracy. SMASH! INCREDIBLE HULK OR WHAT! PV Sindu jumps up high in the air, as much as she can, and smashes a shot towards He Bingjiao's right. Bingjiao dives, but it was not enough to reach the powerful shot. A really poorly executed drop shot from PV Sindhu struck the net and earns He Bingjiao a lead in the second game. Sindhu is looking flustered now, and her movements are not as quick as they were at the start of the match. PV Sindhu vs He Bingjiao China Open Quarterfinal Game 2 begins - Can PV Sindhu bounce back? PV Sindhu loses first game 17-21 against China's He Bingjiao in the China Open quarterfinal match. SMASH! PV Sindhu develops the soul of THE INCREDIBLE HULK as she smashes hard and fast to earn a much-needed point against He Bingjiao. This game is far from over. China Open Badminton Live Score, PV Sindhu, Kidambi Srikanth Live Streaming: Former champions P V Sindhu and Kidambi Srikanth recorded contrasting victories to advance to the quarterfinals of the China Open World Tour Super 750 here on Thursday. 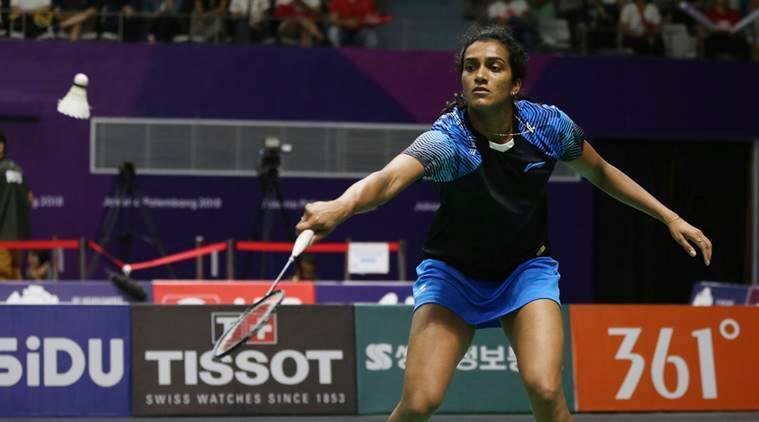 While Olympic and two-time World Championship silver medallist, Sindhu stamped her authority with a 21-12 21-15 win over Thailand's Busanan Ongbamrungphan in the second round, Srikanth got the better off Indonesia's Tommy Sugiarto in a three-game match. The third seeded Indian, who had clinched the title in 2016, will face tough test against eighth seeded He Bingjiao next. Sindhu lost both the meetings against the world no 7 Chinese and would be eager to avenge her twin loss.